Use your own computer and display with our software! Start your Ad Network today for only $149. We have created a software only package to help many people out there wanting to start their own lucrative Electronic Billboard Advertisement business on a budget. This is also a good option for countries that A to Z Mini Billboards cannot ship Ad Servers to due to Home Land Security or very high shipping costs. Try our Ad Server software today and see if your computer system is compatible and how easy it all works. For those of you that have some basic PC skills and an old or new extra computer system just sitting around the home, this package is for you. We suggest you purchase the systems that A to Z uses to keep uniform and the greatest software compatibility as we upgrade and add features to the software. All you need is a basic PC with Windows XP to Window 7 loaded and working, keyboard, mouse and monitor or TV. Once you signup and download our installation package you can become part of our A to Z Mini Billboard Ad Network and start your own Digital Billboard business right away. Once you join our system and get your software downloads you can create as many Ad Server systems as you like by Activating each one for only $50. You are responsible for your own computer systems and displays. If you need a professional website created to use for your new Digital Billboard business we can do that for you too for $99. Download Ad Server software and activate for for each system you want to control – cost $50 each and required. Business website and Ad Hosting yearly fee – cost $99. A to Z Mini Billboards uses a few types of Mico PCs because of their power, size and mounting options. 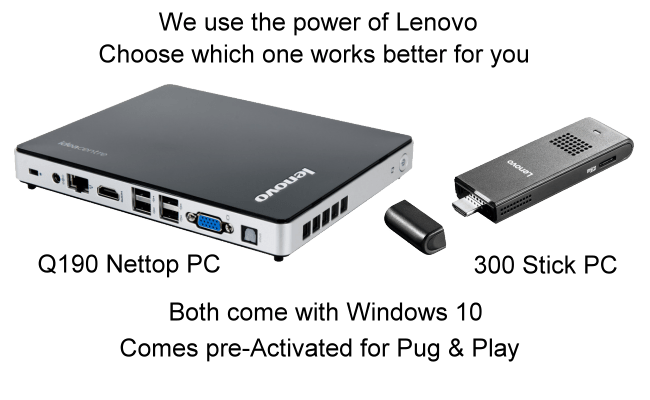 We prefer the Lenovo system from model Q150 and higher which can be found on various websites like Newegg.com, Frys.com and even ebay.com. Any computer that is windows based and has an internet connection will work. The Lenovo IdeaCentre Q serries from Q150 to Q190, which is available with a number of options including a wireless remote with keyboard and trackball. A number of options are available allowing you to tailor your system to your needs.